St. Augustine grass is the most commonly used lawn grass in Florida. It is believed to be native to the coastal regions of both the Gulf of Mexico and the Mediterranean and has adapted to warm, humid, subtropical areas of the world. The turf of St. Augustine is generally green to blue-green in color and is very dense. It grows well in a wide range of soil ph levels, has a relatively good salt tolerance, and has better shade tolerance than many other warm-season grasses. St. Augustine establishes quickly and can be installed as sod, sprigs, or plugs. The major disadvantage to St. Augustine grass its moisture needs. It will require supplemental irrigation during extended dry periods which generally makes having an irrigation system a necessity. This particular grass does not have good wear tolerance and does not hold up well to repeated foot traffic. The major insect concern of St. Augustine grass is the chinch bug which can cause considerable damage if left untreated. St. Augustine has many different strains or “cultivars” each with different positives and negative aspects. Some of the most common are Bitterblue, Classic, DeltaShade, Floralawn, Plametto, and Raleigh. One of the most well-known however is Floratam which was released in 1973 jointly by the University of South Florida and Texas A&M University. Floratam while the most widely produced and used St. Augustinegrass in Florida it has not lived up to its initial claims. When originally released it was documented by UF to have chinch bug resistance. This element has been largely lost over time and chich bugs are now a major pest of floratam. Proper mowing practices are necessary to keep any lawn healthy and attractive. 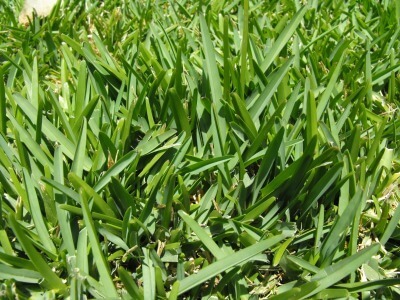 St. Augustinegrass should be maintained at a height of 3.5–4 inches. Repeatedly mowing at lower heights increases the stress on the lawn, discourages deep rooting, increases the chance for scalping if a mowing event is missed or postponed due to weather, and may increase susceptibility to pest problems. Maintaining the right height helps the grass develop a deep root system and gives a better appearance to the turf. No more than 1/3 of the leaf blades should be removed with any mowing. If possible, mowing height should be increased during periods of moisture stress or if the grass is growing in shade. The professional lawn maintenance team at Mr. Tree and Lawn Service is familiar with the needs of St. Augustine and all other types of grass used for lawns in the Gainesville area. We would love to speak to you about your lawn care needs at 352-682-4444 or use the convenient “Contact” feature on our website.